This week Orly launched a salon-only range called GelFX into the Australian market - a gel manicure system that boast chip free colour for up to 2 weeks in answer to the demands for long lasting colour, diamond shine (and perhaps also to CND's Shellac manicure system?). 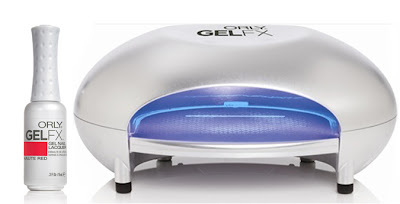 Using LED UV lamp for faster cure time of the 3-in-1 cleanser, primer and base coat, colour and topcoat of the GelFX system. Results are diamond strength durability and shine. It's also easy to remove when the time comes to take the colour off with foil remover wraps. The vitamin infused GelFX formula is also nourishing for nails with vitamin A, E and B5 to promote healthy nails and protect the nail structure and when used with the orange blossom and wild cherry extract based cuticle oil, provides a complete system that protects nail and conditions culticles. Orly GelFX is available in 32 colours that are colour matched to the top selling colours in the permanent collection. This means you can touch up the ends of growing nails at home to prolong the wear which you will definitely need because the GelFX just doesn't chip or fade. I had the pleasure of being one of the first in Australia to experience this new manicure last weekend at the ABBW event at the Maxted Gala and now I find it very hard to go back to basic polish. I had my gelFX manicure in the shade Star Spangled. This is what I call an old Hollywood glamour red with a modern twist. It is a gel finished ruby red with red micro glitter that dazzles and shine under the light and subtle flickers in the shade. This shade is <3 at first sight and a friend and I are planning to place an order for the matching nail lacquer from the website. Below are photos of my nails 6 days after the manicure without any touch ups. You can see my nails are starting to grow out but the tips of my nail are still in pristine glossy and vibrant condition - a first for me since I don't wear gloves for chores! I never been able to have nail colour on my nails last more than 2-3 days without chipping no matter what brand or formula I try (including OPI, Essie, or Orly's normal range). With GelFX, I'm now a convert and I can't wait to book myself in for my next GelFX manicure when I have to attend an upcoming wedding next month. GelFX launched nationally in Australia this week. For your nearist salons, contact Orly on 1300 769 355 or email them at orlysales@orlybeauty.com.au. 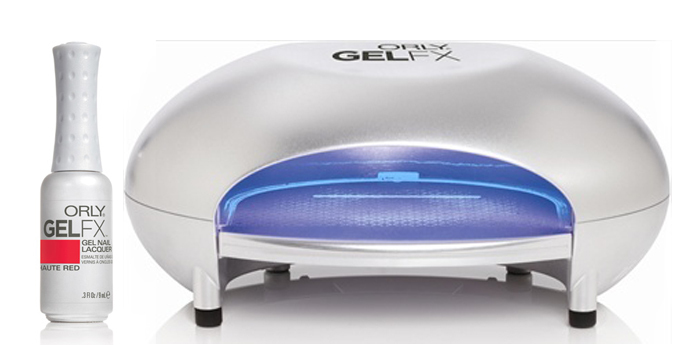 GelFX is also available in the North America at Orly stocked salons. Many thanks to the ladies at Orly, particularly Celeste my manicurist for introducing me to this beautiful shade and for allowing me to experience the magic of GelFX. So who's now keen to try an Orly GelFX manicure? 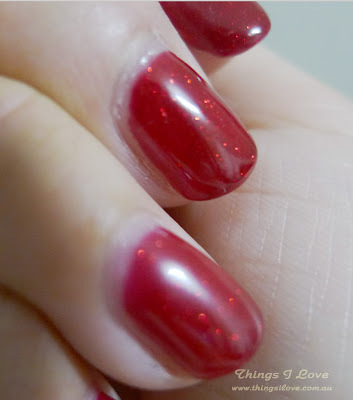 I really want to try that or shellac, because my polish chips pretty much straightway! The red is a lovely colour. ooooh the shade is awesome ... :) ,,how much does the manicure cost ? i am also a chipping queen ..would love to try this ..
Rin - you should either one. I've not tried shellac myself either but I will stick with GelFX since I love this shade and I prefer LED UV light as it cures faster (only 30 seconds each round)! Saumya - the prices will vary between salons but expect about $45-$65 for full manicure and polish and is perfect for special occasions. After looking at your gorgeous nails at the ABBW, I definitely want to give it a try! Thanks Tine and Tammerly - day 9 and there's a slight bit of edge fading but I've been out washing the car. Very impressed. Still in love with the shade too. That colour is AMAZING and your story of how long it's lasted makes me very tempted to try this out for myself..
Omega - definitely give it a go. No chips, dents, smudges, taking too long to dry. Best thing since sliced bread for nail colours. that color looks really nice on you. Thanks for the information. I just found this Orly GelFX for really really cheap on www.amazingbeautysupply.com. I bought enough to get their Free Shipping too.